Who knew that cookies could be savory? I did! 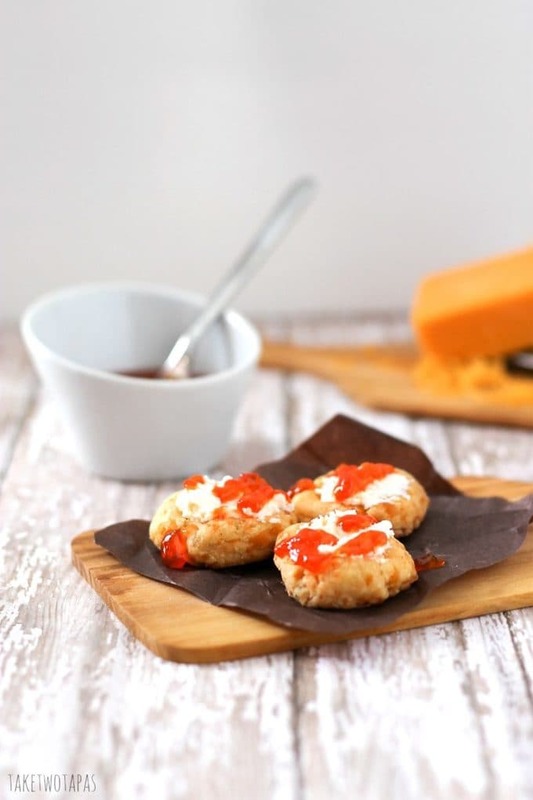 These flaky cookies are really cheese thumbprints, full of flavor and spice, and with creamy goat cheese on top with a sweet and spicy pepper jelly, they are the perfect bite! When I am in the mood for something sweet, I can’t help but go for a cookie. That perfect blend of richness with your favorite sweet flavor nestled in it. But whoever thought that you can satisfy your savory craving with a cookie too? When snacking comes front and center in my brain, it is usually for something salty. Pretzels do the trick. Or a couple slices of cheese. Bake the cheese thumbprint cookies in the oven and then cool. You can make them ahead of time and store until you are ready to serve them. No last minute baking to do! You may think that these are like other cheese wafers out there. They may be the same “in theory,” but not in their soul! These are cheese thumbprints that are ready to party! A little fat and “sassy-ed” up with some goat cheese, not to mention that little kick on top! Hot pepper jelly will pull you in like the Hokey Pokey song. You think you don’t want to dance but can’t help yourself from moving your foot when the song tells you to put your left one in! Grab yourself some coffee, a cocktail, or a big glass of milk and start shoveling these cheese thumbprint cookies in your mouth. You can save the other half of the cheese straw dough recipe for the thumbprints you actually take to the party instead of eating all by yourself. Who knew that cookies could be savory? I did! 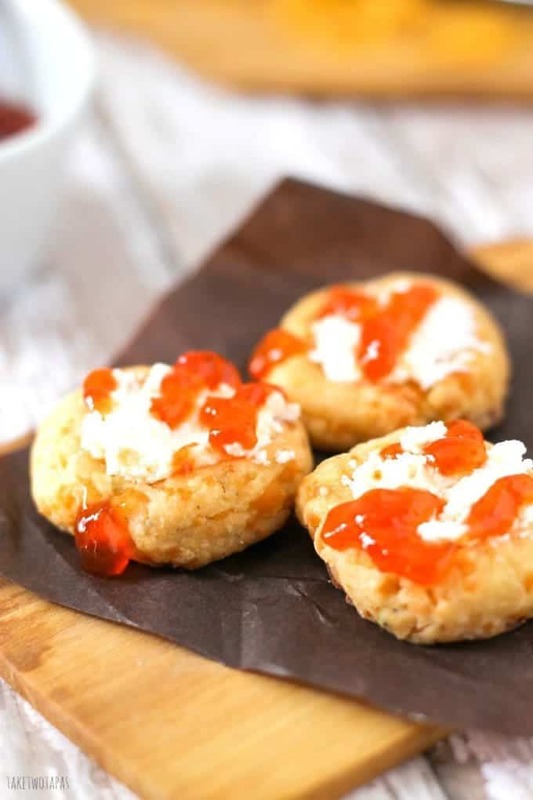 These cheesy, flaky cookies are full of flavor and spice and with creamy goat cheese on top with a sweet and spicy pepper jelly, they are the perfect bite! Take your pimento cheese straw dough and divide into 36, 1-inch balls. Place on a silicone baking sheet or parchment-lined baking sheet and press down with your thumb to make the signature thumbprint depression in the cookie. Bake for 15 minutes or until the edges start to brown slightly. Oven times may vary so you might want to bake one or two to see if the timing is right. The outside should be slightly crispy with some tenderness to the middles. When cool, spread a teaspoon of goat cheese into the depression. Spoon hot pepper jelly over the cookies. You might need to warm the jelly up on the stove or a quick run in the microwave to loosen it up a bit. I usually just take the lid off (metal) and nuke it for about 20 seconds and stir. Then I can just put the lid back on when I am done. No extra dirty dishes. What is your favorite type of snack? Sweet or Savory? Try my other Cheese Recipes! « Substitution School – Missing Ingredients for Cooking? Oh my goodness…I could spend all afternoon looking at your recipes! 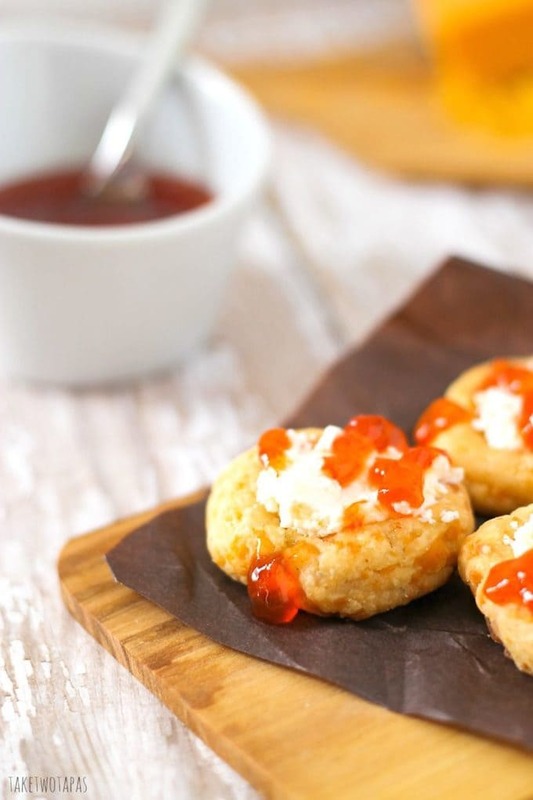 As soon as I saw the Spicy Cheese Thumbprints with Goat Cheese, I was hooked! Thanks for joining me on the West Palm Beach Food Tour this afternoon as we ate our way through the culinary landscape of downtown. Thanks for a great tour and I am so glad that you like the cheese thumbprints! 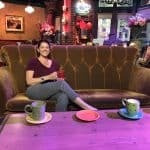 See you on our next visit to WPB! Love the flavors here! I have a neighbor who always seems to have pepper jelly on hand – she’s going to love these! Love the sweet and spicy contrast! These look so good! 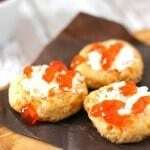 I love the sweet and hot chile pepper jam with the cookie–that is genius. I love sweet and spicy together! Yum! These look delicious, perfect as a snack or an appetizer! What a great appetizer or part of a lunch! The savoury flavours compliment the goatcheese and pepper jelly well! I’ve only made savory cookies once and it was way too long ago! I need to fix that! These are beautiful and I love the flavor combo and different textures. Thanks Faith! I love playing with sweet and savory together!